Sigrid Kaag, Special Coordinator of OPCW-UN Joint Mission addresses the OPCW Executive Council Meeting. While there has been good progress so far in the effort to destroy Syria's chemical weapons, a great deal of work remains, the Organisation for the Prohibition of Chemical Weapons (OPCW) heard today, as it prepares to adopt a destruction plan submitted by the Government. While there has been good progress so far in the effort to destroy Syria’s chemical weapons, a great deal of work remains, the Organisation for the Prohibition of Chemical Weapons (OPCW) heard today, as it approved a detailed destruction plan submitted by the Government. In the plan, approved by the Organisation’s 41-member Executive Council, Syria’s chemical weapons will be transported outside its territory to ensure their destruction in the “safest and soonest manner,” and no later than 30 June 2014. The Special Coordinator of the OPCW-United Nations Joint Mission overseeing the destruction of Syria’s chemical weapons stockpiles said the progress so far has been “heartening,” furthered by constructive cooperation with the Syrian authorities and strong support from the international community. 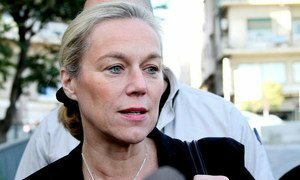 “However, substantial work remains to be done, and a number of challenges lie ahead,” Sigrid Kaag said in her address to the Executive Council’s meeting in The Hague. At the end of October, the Joint Mission confirmed that the Syrian Government has destroyed critical chemical weapons production equipment, rendering it inoperable. By doing so, Damascus has met the deadline set by the OPCW Executive Council to complete the destruction of such equipment by 1 November. The Joint Mission, said Ms. Kaag, is looking to Member States that have influence with all actors to support it in the successful fulfilment of its mandate, through their lines of formal and informal communication. Formally established on 16 October, the Joint Mission is mandated to oversee the timely elimination of the Syrian chemical weapons programme in the safest and most secure manner possible. “Going forward, our priority will be the coordination of donor offers to ensure the Joint Mission is adequately equipped – and the Syrian authorities appropriately supported – to ensure removal and destruction of chemical materials within the ambitious timelines we have set,” Ms. Kaag said. The Joint Mission of the Organisation for the Prohibition of Chemical Weapons (OPCW) and the United Nations overseeing the destruction of Syria’s weapons programme confirmed yesterday that the Government has destroyed critical production equipment, rendering them inoperable. By doing so, Syria has met the deadline set by the OPCW Executive Council to complete the destruction of such equipment by 1 November.